Slips, they can happen virtually anywhere. We evaluate 3 key workplace situations affected by slip hazards and suggest a proven safety matting solution for each environment. Commercial kitchens are often very busy environments, especially during peak service hours. Careful kitchen design is essential for avoiding slip and fall accidents, while making the environment more efficient. There are a range of hazards which can be avoided by introducing anti-slip matting. Diamond Grid, is one of our most popular matting products for kitchen environments. One of the key features is the anti-slip top surface. It is also manufactured from extremely flexible PVC, a hygienic material that does not support the growth of bacteria. The diamond surface pattern allows liquids and debris to drain through the open holes, rather than resting on the top to reduce the risk of slipping. All of these features make the mats ideal for kitchens and food preparation areas. Swimming pools are hotspots for slips, trips and fall. They account for many slip-related accidents. They can be especially hazardous where water collects at the edge of the pool, in changing areas and showers. But the risks can be reduced by using anti-slip matting, such as Leisuremat, one of our most popular PVC safety matting options for swimming pools and the leisure industry in general. The open holes that form part of the Leisuremat design are not just there to look good. They serve a purpose by draining surplus water from the mat’s surface and providing slip-resistance underfoot. This hygienic floor mat has been designed specifically for use around swimming pools, changing rooms and other leisure areas. Manufactured from flexible vinyl, it’s ideal for helping to prevent slipping in barefoot, wet environments. Slips and falls cost engineering facilities (and industrial businesses in general) dearly. They cause personal suffering and through absenteeism, can have a serious impact on productivity. Selecting the right matting for your environment not only minimises health and safety risks, but can also reduce worker fatigue for employees who spend long periods of time standing on hard concrete floors. Worksafe (in greaseproof blue) is an ideal multi-tasking solution with anti-fatigue and anti-slip benefits. 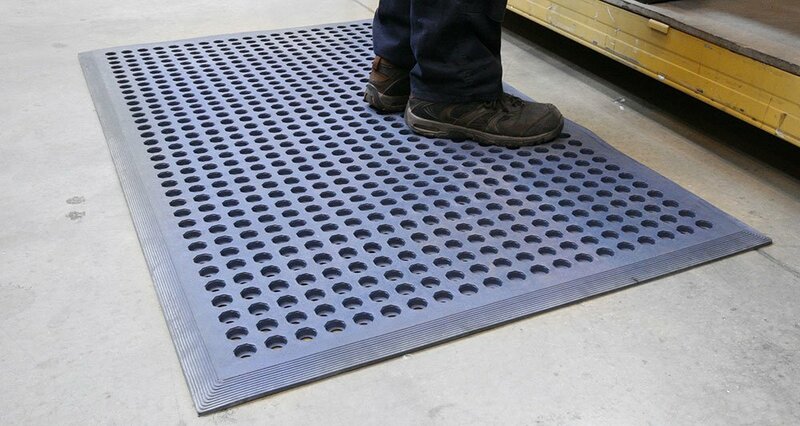 It features open holes that allow any spillage to drain through the mat, reducing the risk of slipping as well as fatigue from prolonged standing. This is a real workhorse of a safety mat, as it is very resilient to grease and aggressive oils. It’s the perfect anti-slip mat for engineering facilities. The anti-slip underside of the mat also helps to minimise movement, holding the mat in position on the floor surface.